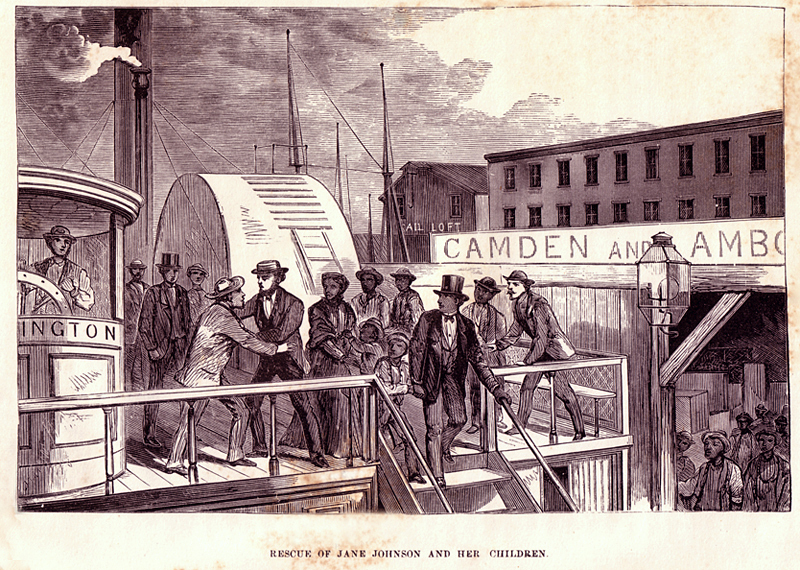 "Rescue of Jane Johnson and Her Children," published in William Still's The Underground Railroad, Philadelphia: Porter and Coates, 1872. Flip to Engraving of Jane Johnson, published in William Still's The Underground Railroad, Philadelphia: Porter and Coates, 1872.
Credit: From The Underground Railroad by William Still Philadelphia: Porter and Coates, 1872. A prominent African-American abolitionist, William Still published this image of Jane Johnson and her children in his 1872 account of the incident. In 1855 Still and others had conspired to protect Johnson, igniting a sensational trial that captured the dilemma of being a slave in free Pennsylvania on the eve of the Civil War.